In amongst all of the Thanksgiving roast turkey dinner leftovers and turkey sandwiches with cranberry sauce last week I tried something new. I had a bunch of leftover cranberry chutney and I was wondering what to do with it. One of the first things that I thought of was the baked brie with cranberry sauce that I had tried a while ago and really enjoyed. I then thought that it would also work well in sandwich form. You can’t really go wrong with a sandwich that starts with lots of ooey gooey melted brie and I already knew that the cranberry chutney would go well with all of the melted cheese. Since I also still had some leftover roast turkey I could not see why I shouldn’t add some to the sandwich while I was at it. 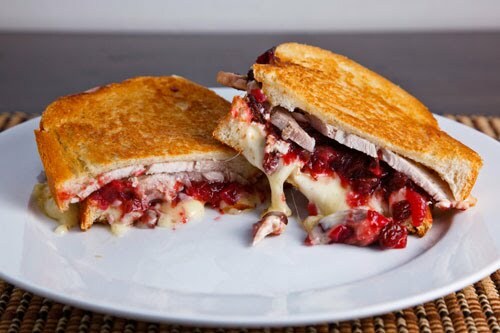 So I ended up with a grilled turkey and brie sandwich with cranberry chutney and it turned out great! The melted brie and sweet and tangy cranberry chutney along with the turkey was a great flavour combo and the slightly crisp buttery bread that wrapped it all up was the perfect finish. I can’t wait for some more leftover turkey and cranberry sauce to make this sandwich again. Assemble the sandwich and grill over medium heat until golden brown and the cheese has melted, about 2-4 minutes per side. WOW…I too love these flavor combination's, this sammie looks fabulous. It would be great with some soup on a cold Beaverton night. Brie/cranberry/turkey seems like the perfect way to enjoy Thanksgiving leftovers! STOP! I can't take it! I might just have to cook up a turkey early so I can have one of these. Awesome photo Kevin! Can't wait to try this flavor combo…wow!! Awesome! I am sooo ready for Thanksgiving! oh. my. god. this sounds incredible. Now that's one beautiful sandwich Kevin! I really shouldn't have looked at this post while my stomach is *growling*. That just looks too, too good. This sandwich is the exact reason why I love Thanksgiving and fall foods. You have combined all of my favorite parts of the holiday in one. Can't go wrong with melted brie and cranberry sauce! Wow! This looks so good and easy to make as well! we are going to have to make this when we have our leftover Thanksgiving turkey! This looks amazing — I might not be able to wait for the Thanksgiving leftovers to try it! Thanks! I should have known these were yours when I stumbled across them over at Tastespotting. Those sandwiches look awesome! This looks absolutely fabulous. Can't wait for U.S. Thanksgiving to have this. You had me on these sandwich. I think I would rather have these than have a Thanksgiving dinner. Not only must this taste wonderful, the chutney creates the perfect shock of color! I love it; I can't wait to have turkey leftovers. What a feast for the eyes, Kevin!! Very seasonal & so tasty too!! Brie is so good with cranberry! This looks delish! I can't wait for Thanksgiving! I had a turkey sandwich for lunch but it doesn't come close to yours, Kevin. Adding brie is perfect. You had me at "ooey gooey melted brie"! This sandwich does indeed look extraordinary! My Thanksgiving is a month away, and now I know what I want to do with some of the leftovers. YUM! Love the idea of using brie, which melts so perfectly. What a great use of leftover turkey. Wow, this is mouth watering. I will have to make this one with our upcoming Thanksgiving leftovers! brilliant! i love your "waste not, want not" attitude. looks delish! You should re-post this the day after Thanksgiving. It's the perfect day after Thanksgiving leftover sandwich! I've been making my own rendition of this for a few years. The only real difference with mine is that I use raspberry preserves on it instead of cranberry and I'm addicted to it! Ham and turkey both go really well with it.